Old Hymerian, Charlie Weatherill (at Hymers 2001 – 2011) embarked on a ‘6 Marathons in 6 Days’ challenge in April 2018. He started at Big Ben and set his finish line at the Eiffel Tower in Paris. Charlie’s target was to raise at least £5,000 for Make-A-Wish UK, a charity that works to enrich the lives of children and young people with life-threatening conditions. Charlie’s family and friends rallied round and supported him throughout his challenge, with some even joining him on his epic journey to cheer him over the finish line as he reached Paris. Charlie beat his initial target and raised a fantastic £5,500 for Make-A-Wish UK. Ed Calvert (at Hymers 1985 – 1992) embarked on a mammoth trek earlier this year in aid of Alzheimer’s Research UK. His aim was to walk 2,500 miles in total, over an 8 month period, accompanied by his black Labrador, Seth. The pair started their epic journey on 5th April and planned to complete the 15 National Trails across England and Wales carrying their provisions and camping along the way. Even Seth had to help out by carrying his own food! trails that included the Pennine Way, Offa’s Dyke Path and Glyndwr’s Way, Ed and Seth unfortunately had to postpone the rest of their trek due to lack of funding. It is only a postponement for now as their intention is to carry on where they left off when the circumstances are favourable. 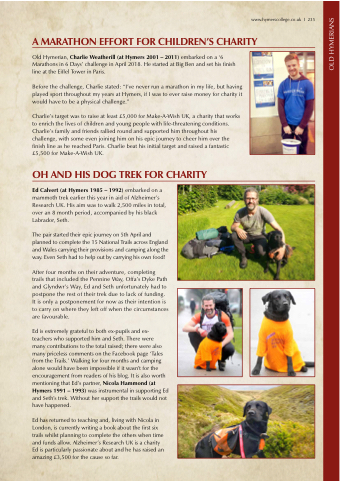 many contributions to the total raised; there were also many priceless comments on the Facebook page ‘Tales from the Trails.’ Walking for four months and camping alone would have been impossible if it wasn’t for the encouragement from readers of his blog. It is also worth mentioning that Ed’s partner, Nicola Hammond (at Hymers 1991 – 1993) was instrumental in supporting Ed and Seth’s trek. Without her support the trails would not have happened. Ed has returned to teaching and, living with Nicola in London, is currently writing a book about the first six trails whilst planning to complete the others when time and funds allow. Alzheimer’s Research UK is a charity Ed is particularly passionate about and he has raised an amazing £3,500 for the cause so far.